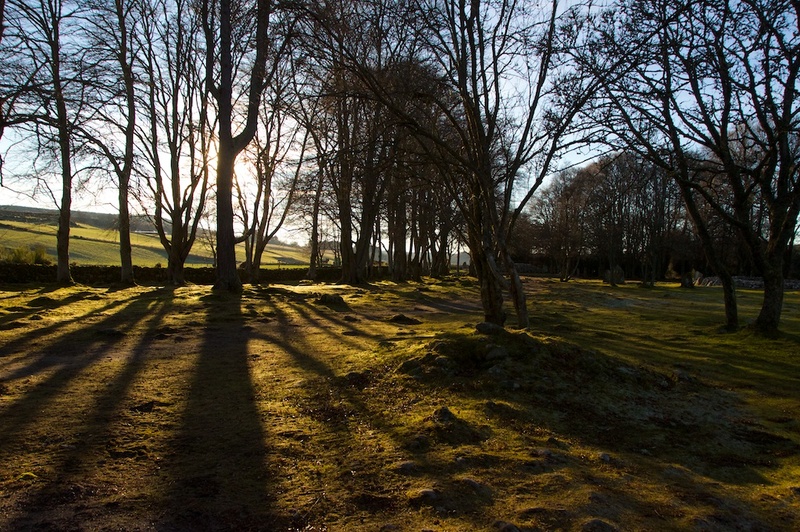 We came across Clava Cairns as the sun sank in the winter sky, glinting through the branches and leaving deep shadowy hollows still thick with frost from the night before. It’s a place that you have to seek out, taking a few turns down narrow country roads, past fields and woods until a long stone wall and a brown road sign tell you that you’re there. Pulling into the small car park alongside, you’re still not really aware of the place until you step out from the trees and into the grassy area that they seem to be so intently guarding. Then you see them: three wide circular mounds topped with rounded cobbles, each one apparently surrounded by its own ring of standing stones. Long shadows radiated like fingers, blurring the edge between reality and imagination. Sunlight caught random patches of moss and stone, while on the lee side all was in darkness. For a few seconds I felt like an intruder. Then I remembered the feeling that these places so often bring: a kind of untouchability combined with familiarity, a sense of both mystery and reassurance. The Clava Cairns, or more specifically Balnaruan of Clava which is the name of this particular site, were built about 4,000 years ago. Two are passage graves and the third is a ring cairn, which has no apparent path to the central chamber. Just to one side is a fourth site, the remains of a kerb cairn. 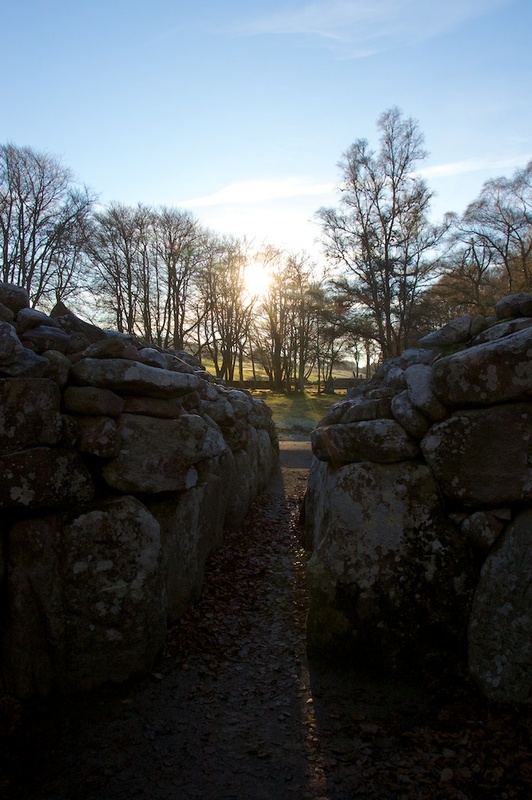 The two passage graves are aligned north-east to south-west, and their entrances are positioned so that light from the setting sun would shine down them on the shortest day of the year. The internal chambers would once have been completely covered with a corbelled roof, rising to a height of four metres. Historic Scotland reports that the stones chosen to build the north-east grave were graded by height and also by colour: those which would have been lit by the midwinter sunset are deep red sandstone, while those chosen to face the sunrise are paler, sometimes with quartz crystals. This is no longer obvious unless you’re a keen geologist, because of the liberal coating of lichen. I stood inside the north-east chamber and faced the sun: the effect was surprisingly warm, and there was a feeling of being insulated from all outside noise. It was quite womb-like. Once again, I wonder if these places were constructed for the purpose of sound as well as light. Historians believe that both passage graves may have been sealed a few years after completion, with the addition of low rubble platforms running around the perimeter of each. Archaeological finds outside the north-east grave include cremated bone and seashells, leading to speculation about possible rituals. Stone circles were also erected around each grave, as if to protect them. The ring cairn, which stands between the two passage graves but slightly offset from the midwinter alignment, is thought to have had a different purpose. It has no entrance, and it was never roofed. As you walk around it, you can see three or four short lines of rubble extending outwards from the perimeter of the mound, giving a sunray effect. Individual upright stones in the surrounding stone circle mark the termination of these rays. 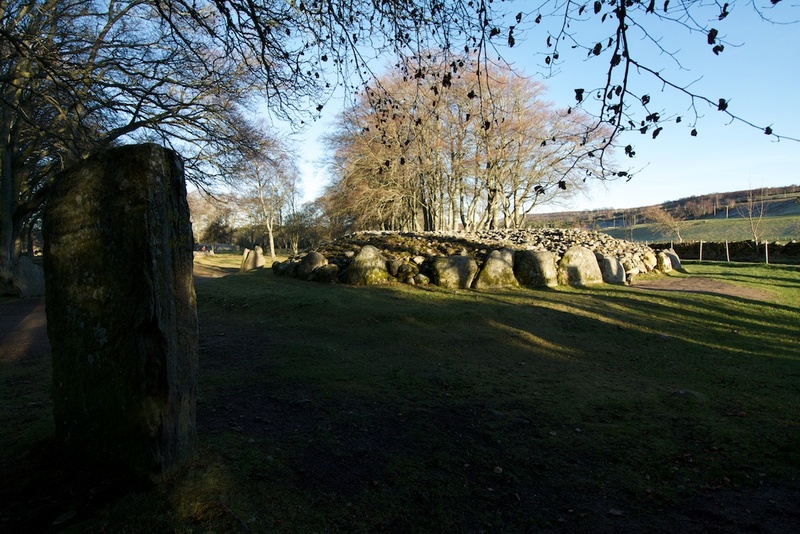 The study of similar sites in Aberdeenshire has led experts to believe that fires may have been lit inside the cairn, for purposes which we can only imagine. No human remains have been recorded inside either of the passage graves. They may have been lost in comparatively recent times: in the 19th century, amateur archaeologists were fascinated by sites like these but they lacked the means to preserve fragile remains once they had been exposed to the elements. A Victorian landowner planted trees around the site to enhance its atmosphere, and some of the cairn stones were used to build the adjoining wall. 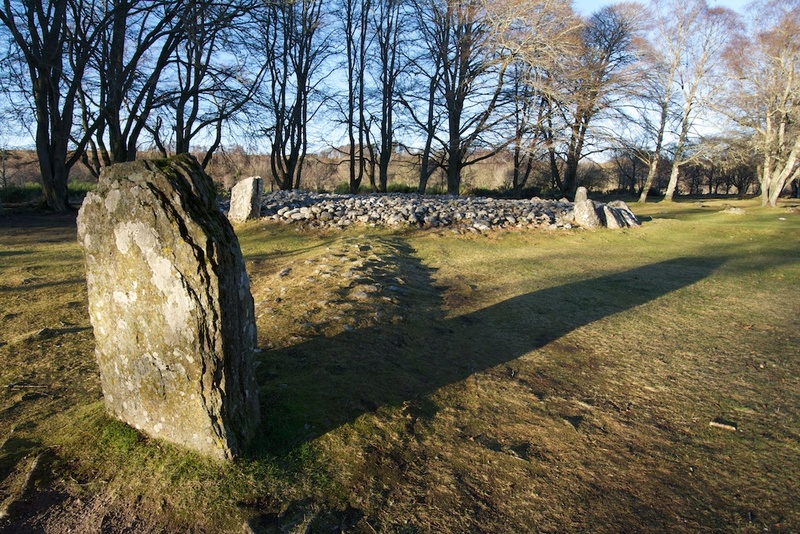 Despite this well-meaning but misguided interference, radiocarbon dating has still given a fascinating glimpse into the purpose of Clava Cairns in the Bronze Age, and its interpretation extends to the wider landscape of Inverness and the Moray Firth, where the remains of about 50 similar cairns have been found. 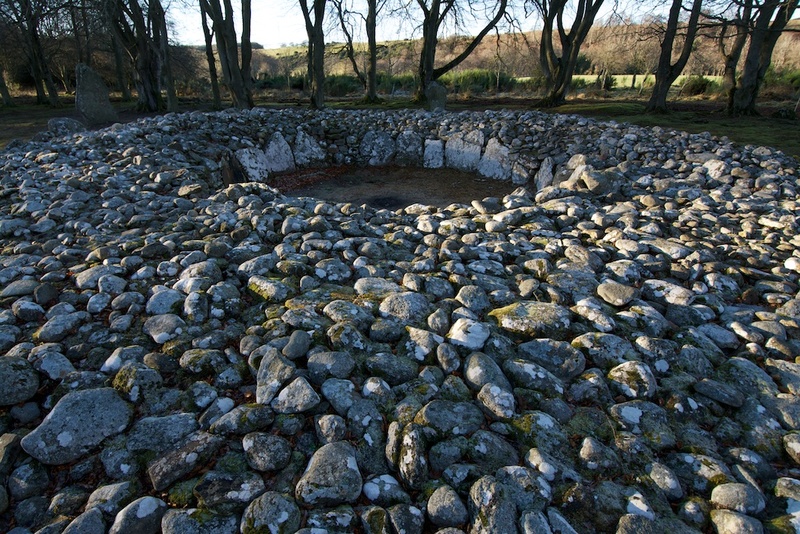 It is clear that Balnaruan of Clava was venerated long after its original builders had disappeared, and re-visited at regular intervals throughout history. 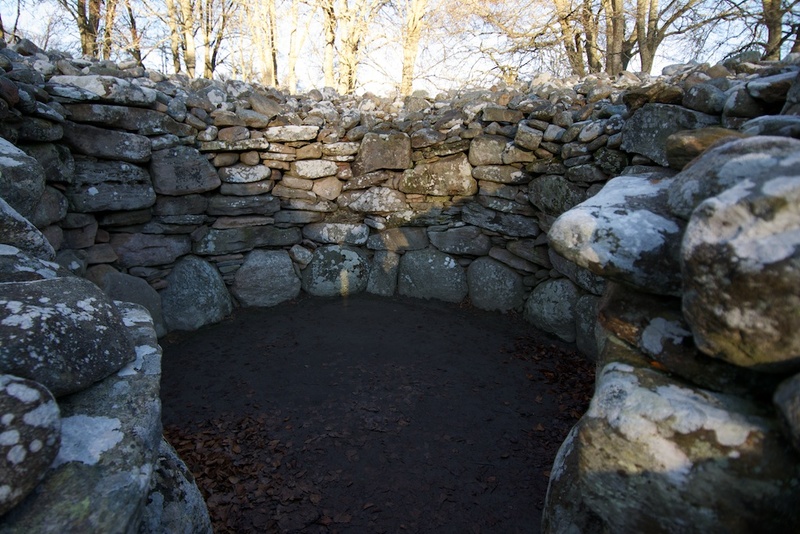 The kerb cairn was added a thousand years later, and a Pictish cremation was found by the ring cairn. Nearby, at Milton of Clava, the remains of medieval chapel stand next to another cairn. The beech trees add a lovely flowing element as they encircle the site, many of them extending their longest branches inwards as if to brush the stones. 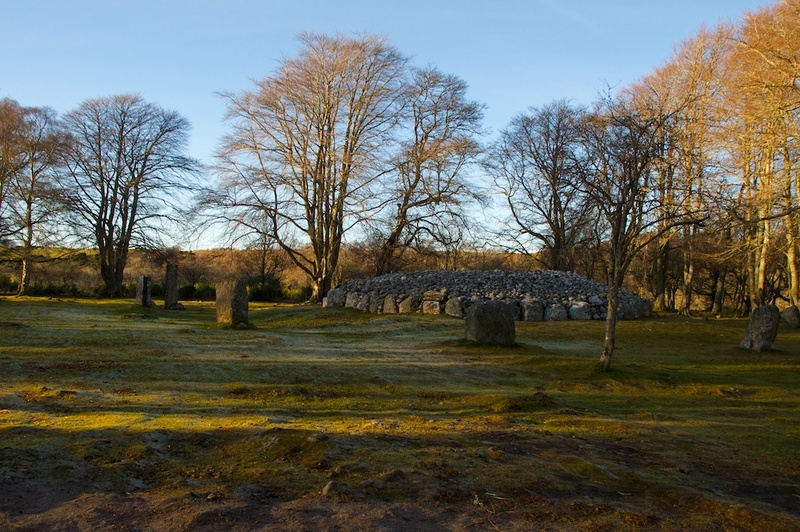 As a result, Clava Cairns feels softly shrouded, even at a leafless time of year. It’s a gentle place, one step removed from this world, its pulse beating to a rhythm much slower than our own. 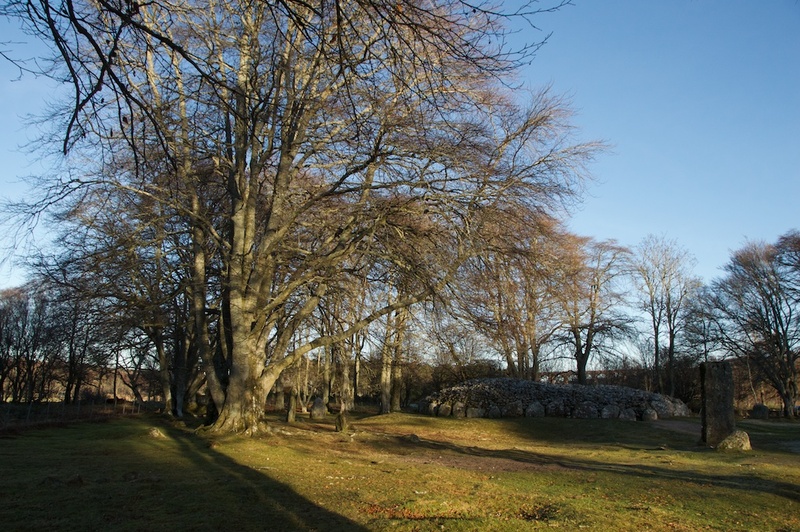 The Clava Cairns are open all year round, and admission is free. To find them, visit the website of Historic Environment Scotland. Thanks, Lynne. Hope you have an enjoyable trip! Our first visit up that way for many years – plenty to see there and I hope you get good weather for it. 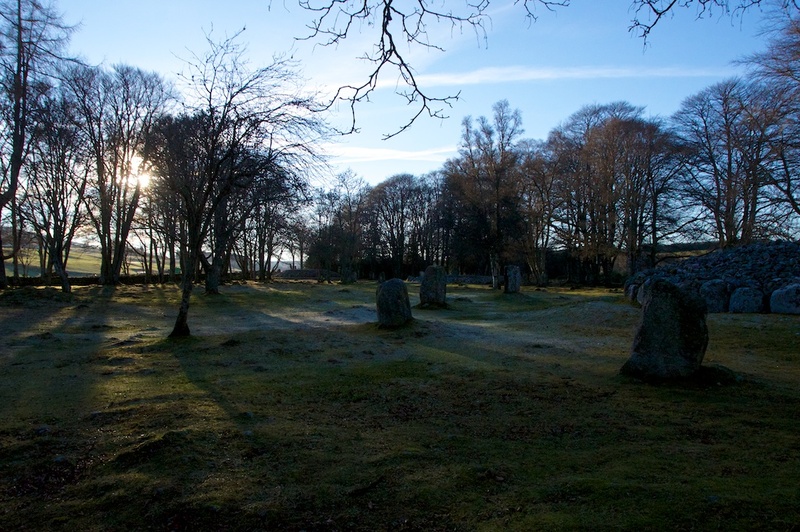 The Clava Cairns, deep in history and the highlands…. Thank you, Jim! A wonderful place to explore, and we were lucky to catch it in such beautiful weather. This sounds and looks like a place I’d like to visit one day. So quiet and peaceful. I love the way you write and described it Jo. That’s really kind, thank you! There is something about these places that defies words sometimes. Nice to know that you feel it too! The lighting really added to the atmosphere – it was as if we reached it at a perfect time of day. Wonderful description of the atmosphere at the cairns. It left an impression on me when I was there over thirty years ago that I’ve not forgotten. Thank you, Lynn! 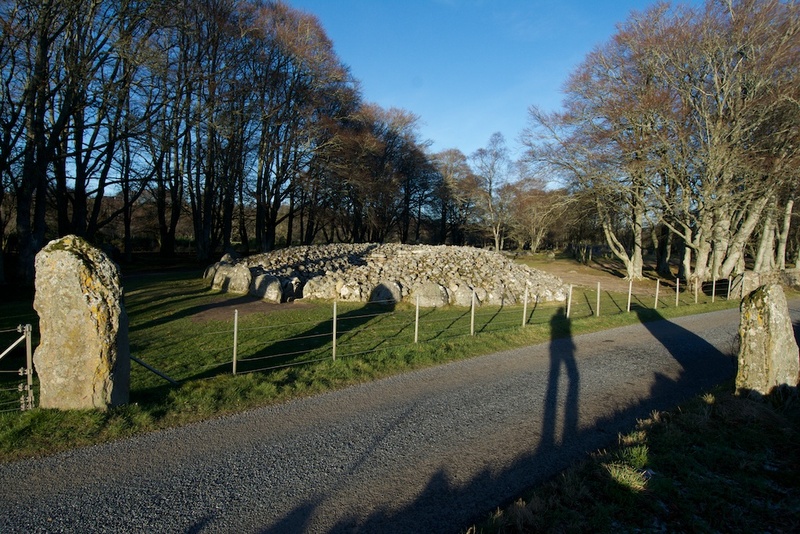 It was my first visit to Clava Cairns and I know I won’t forget it either. I was glad to see it in these conditions and in winter. I am sure that the atmosphere changes very subtly through the seasons, and it would be nice to visit it later in the year, to feel the difference. Fascinating, and so much to wonder about! I know! Those stones have seen so much, like silent witnesses. It would be lovely to see the landscape at that time as well, to put it in context. Lynx, bear and wolf in the forests. A wilder place to us, but these people would have felt such a kinship with it. That was a big trip out, but right up your street I think. They are very impressive cairns and incredible to think they’re so old. It looks as if it was pretty chilly for your visit, but your photographs feature lovely low angle sunlight, which no doubt added to the magical atmosphere. It was indeed a big trip out! 🙂 We were lucky with the M9 and had hardly any traffic. Fabulous day weatherwise – we managed to combine this with Culloden which is only a stone’s throw away! 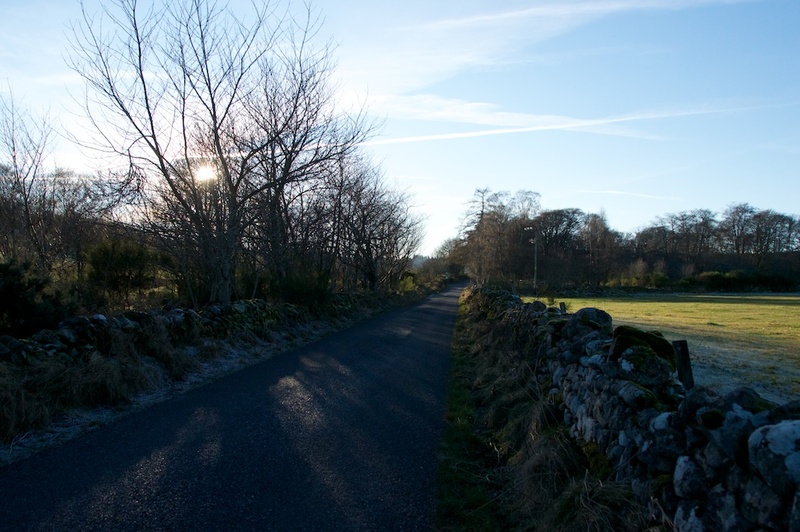 I loved the lighting at Clava and we only just got there in time as the shadows were already quite challenging. Thank you, Lorna! I like very much your third photo. Beautiful light. Thank you, Cornell! Yes, the light there was just beautiful. Winter sunlight has a purity about it. A very atmospheric place and I think that the trees planted around the site by the Victorians add to the sense of quiet and stillness. You feel you are entering a different world. It’s particularly beautiful in the late autumn when the trees are so colourful and the ground around the stones is carpeted with leaves. 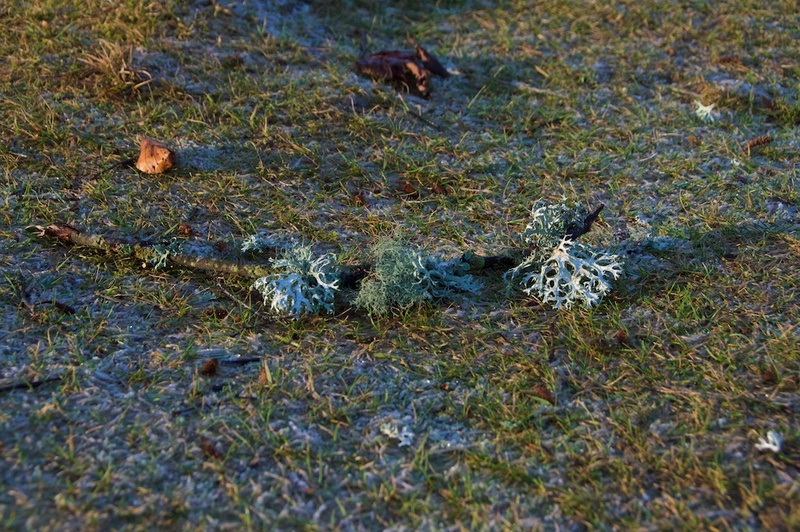 Enjoyed seeing your photos of it on a frosty day. I can imagine how lovely it is in autumn, with all the beeches turning colour. That’s very true, that you feel as if you’re stepping into another dimension somehow. Glad you enjoyed it – thank you! Very cool place. I’d love to see it one day. It’s wonderful, Brenda – such an ancient landscape. I hope that you can visit it sometime soon! I remember Scotland with affection. I wish I could get back there and see all the things I missed. Wonderful images of a place rich with spirit and long ago stories. 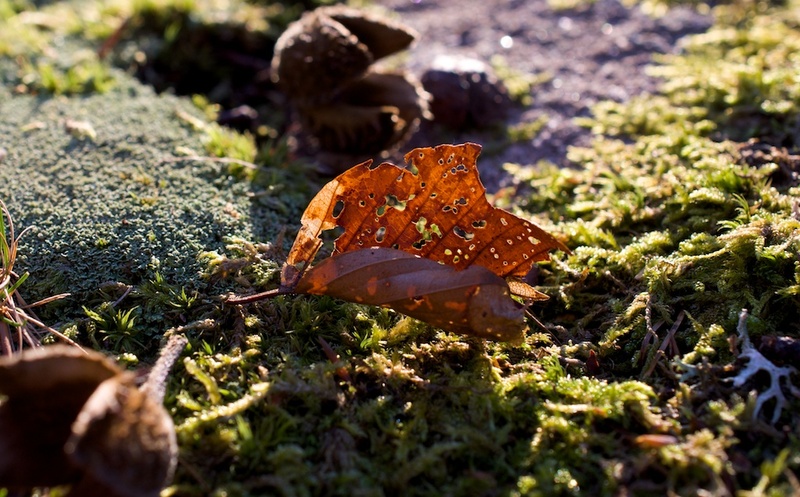 I enjoyed the little and large details that you have captured and shared.